Just back from a five-day Diwali break trip to Agra and Delhi. In Agra we toured the Taj Mahal, Agra Fort, Ram Bagh (a magnificent Mughal era garden), and Chini Ka Rauza (mausoleum of Shah Jehan’s prime minister Afzal Khan Aalmi, himself a noted poet). In Delhi, we did a hilarious, whirlwind auto-rickshaw tour of Government center area, including the India Gate, houses of Parliament, and the embassy area; then a day in the National Museum, the Crafts Museum (a must-see if you are a weaving or textiles fan), the Red Fort, and at the end – a shopping trip to Dilli Haat. If you are ever in Delhi, insist on going to Dilli Haat. Your driver may try to steer you to a different crafts or souvenir store, but stand firm. You’ll find better quality goods at much lower prices, and without the “foreigner tax” so often encountered elsewhere. The week was unforgettable, and I’m sure I’ll be posting some select tourist pix over the coming week. But folk here are reading for needlework content, so I’ll lead with that. The pictures above look rather pinkish, but the actual background color is more dun than salmon or orchid. 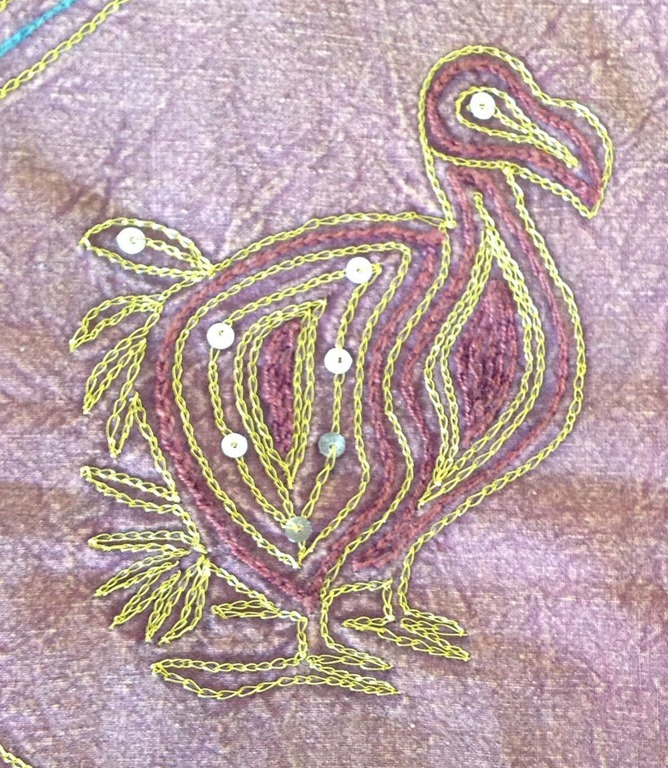 The dodos are worked in tambour-worked chain stitch in gold and brick, olive and mustard perle cotton on a double-thick cotton ground, then heavily washed. The sequins are affixed along the lines of the gold stitching. That along with the treatment of threads on the back clinches the working method for me. I hope to mount this as a room divider curtain on a brass rod between our living room and dining room. Long ago there was just such a brass rod in that wide opening, and now I have something worthy of replacing it. Mary Corbet over at Needle n’ Thread has just posted an interesting piece contrasting tambour needle produced chain stitch with the same stitch produced by a traditional threaded needle. She notes the speed, density and coverage factor of tambour stitching. I present a truly huge sample to corroborate her observations. I have an entire room-size floor carpet done in tambour work. For those of you who don’t know what tambour is, it’s a method of producing an even embroidery stitch with a chained appearance, by plunging a hook through a base fabric, catching a loop of decorative thread, then repeating the process to create a line. The hook used (called arhi, here) looks a bit like a fine crochet hook, but the end of the hook is a bit more pointed, to make piercing the ground fabric easier. Mary offers up some excellent discussions of the technique, so I’ll skip doing so. 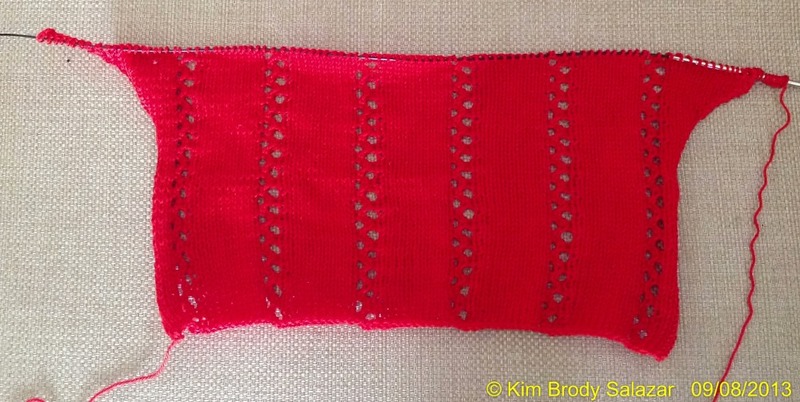 By getting close up with my gauge square, I can see that the stitch count varies between 10 and 12 stitches per inch, with the longer stitches being in the plain areas like the simple straight pink and brown runs at the bottom of the detail, above. For width, about three rows of stitching equals 1/3 of an inch, with the longer stitch areas being a bit narrower in addition to leggier. 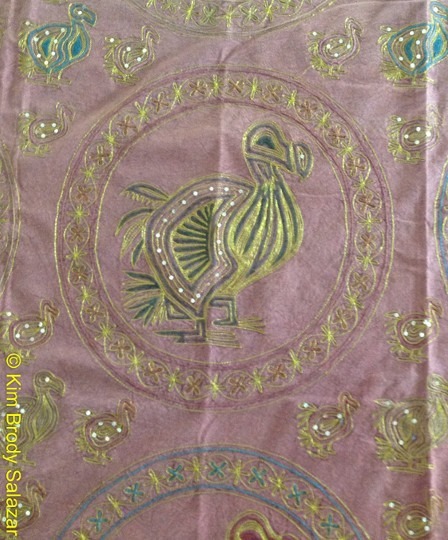 Perhaps the less skilled stitchers were assigned the boring border areas, and the more skilled artisans did the intricate motifs. In any case, because of the variability of stitch length and some small mistakes here and there, I am pretty confident that this rug was done by hand and not with a sewing machine. If I flex the heavy canvas ground cloth, I can see some pencil lines behind the stitching that mark off major design areas, but not every area or motif is indicated. Finally, the entire piece is backed with another layer of cotton sheeting, slightly thinner than the natural color ground cloth. 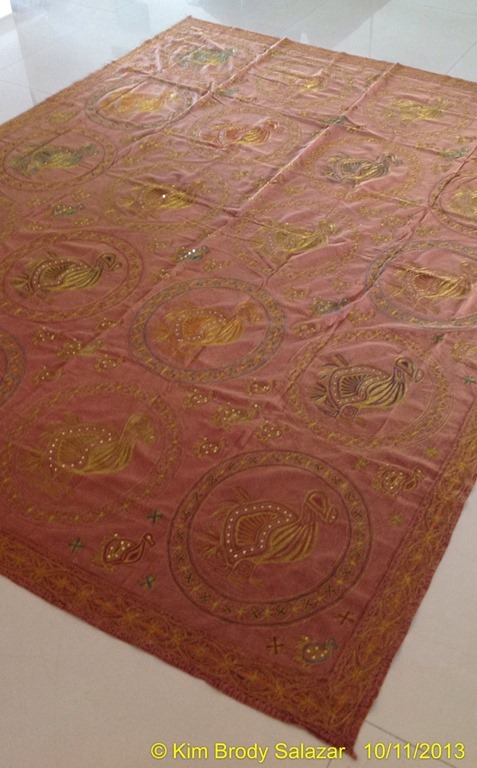 Our rug came from the Kashmiri area further north, the source of so many of the handcrafts available here in Pune. It’s a bit unusual because this type of stitching is more commonly done in wool. Namdas for example, are tambour stitched rugs worked in wool (or sometimes today, wool/acrylic blend or even cotton) on a felted wool ground cloth. I’ve seen them both here, and occasionally in import stores in the US. Back to our carpet – how long did it take to make? Tambour is speedy, but 6’ x 9’ is a huge amount of handwork. The crafts merchant who sold it to us said that these pieces were the product of family manufacture. It typically takes several people (I’m thinking four to six, more can’t easily fit around the cloth to work) about two weeks to make one this size. I base this on the fact that he says one family can produce between two and four big pieces per month. Ours was one of the largest. Most of the other samples of cotton tambour were about half this size. To my stitcher’s eye, ours was also the most accomplished of the four available cotton rugs. 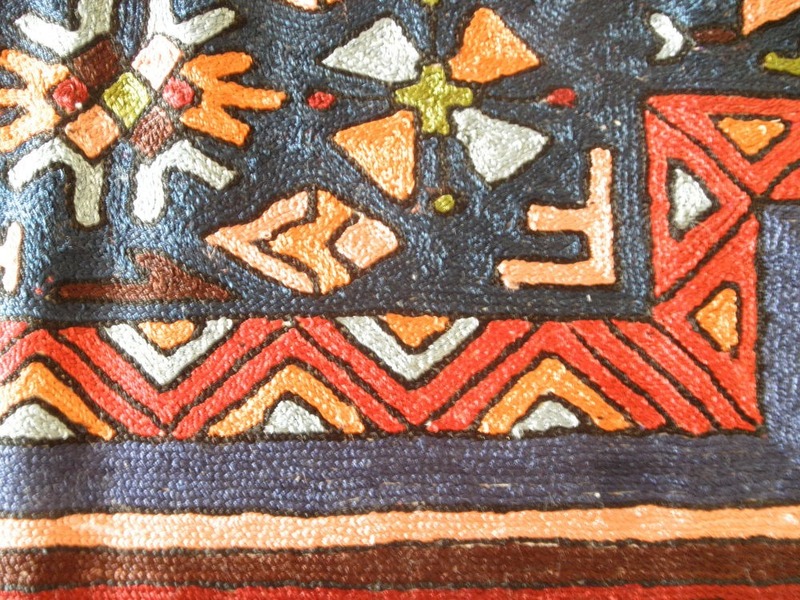 It was the most evenly and densely stitched, with the best color balance and patterning. The stitched surface is holding up nicely to moderate traffic, although we are careful with it. We do not wear shoes in the house, and I do not subject this piece to the vacuum. Instead I light surface sweep with a soft plastic broom, and supplement that with occasional shake-outs. Thankfully, nothing has spilled on it. Yet. 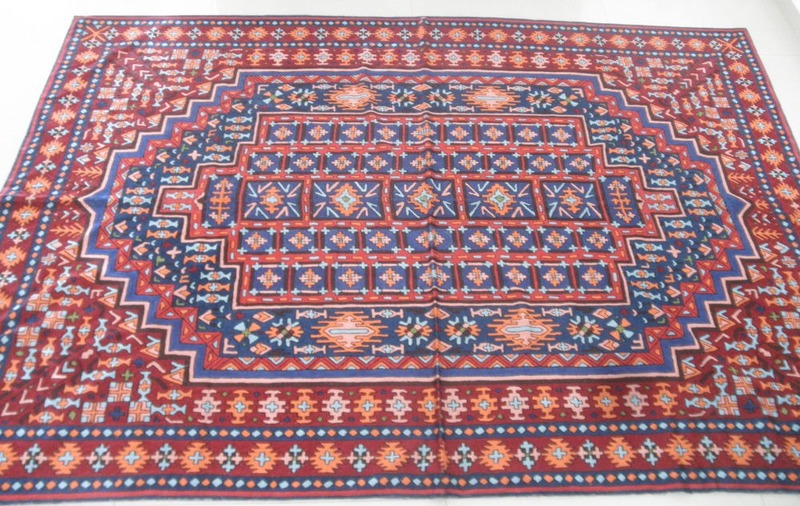 We bought this piece because we fell in love with the brilliant color, intricate patterning; and because I appreciated the skill that it took to produce, and the magnitude of labor it represents. It’s time and care, rendered in cotton, and will be one of my favorite keepsakes, long after we return home. There’s always something a bit bittersweet about the end of a holiday or festival. All that preparation before, then the exuberance of celebration, followed by an ending. And then all that’s left is clean-up, thinking on the past, planning for the future, and looking over the pictures. Yesterday was the end of the 10-day annual celebration in honor of Lord Ganesh. 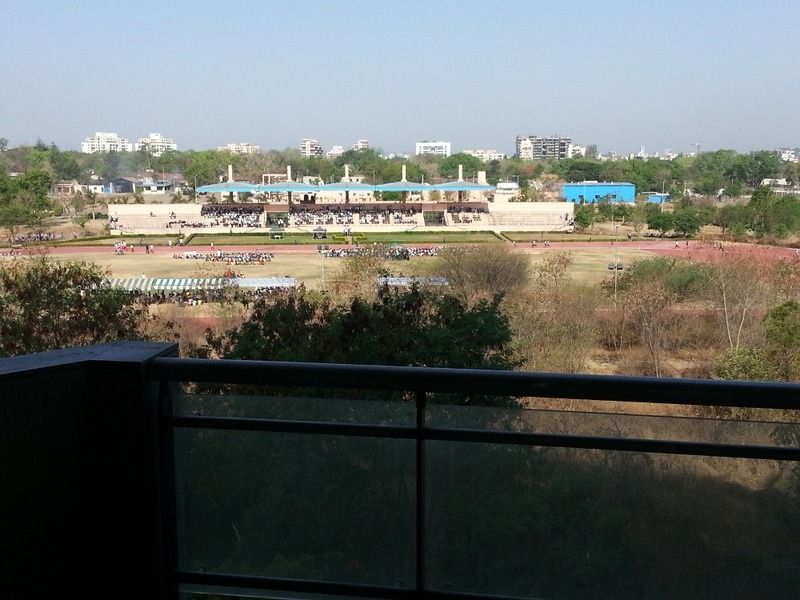 We didn’t get to see the very heart of the festival in Pune – that was accessible only by wading on foot through blocks and blocks of dense crowds in the old parts of the city at night, something inadvisable for Western women on their own. But thanks to the resourcefulness of Driver Rupesh, we did get to catch some of the sights and excitement around the edges. First, there are over a thousand sanctioned celebratory platforms (pandals) raised by various affinity groups – civic associations, merchant groups, political parties, charitable organizations, religious affiliates and so on. And there are easily as many “unofficial” pandals, not registered, erected by still other smaller groups; in addition to an uncountable number of displays and altars in private homes. Rupesh drove us around the edges of the area cordoned off for pedestrian traffic only. 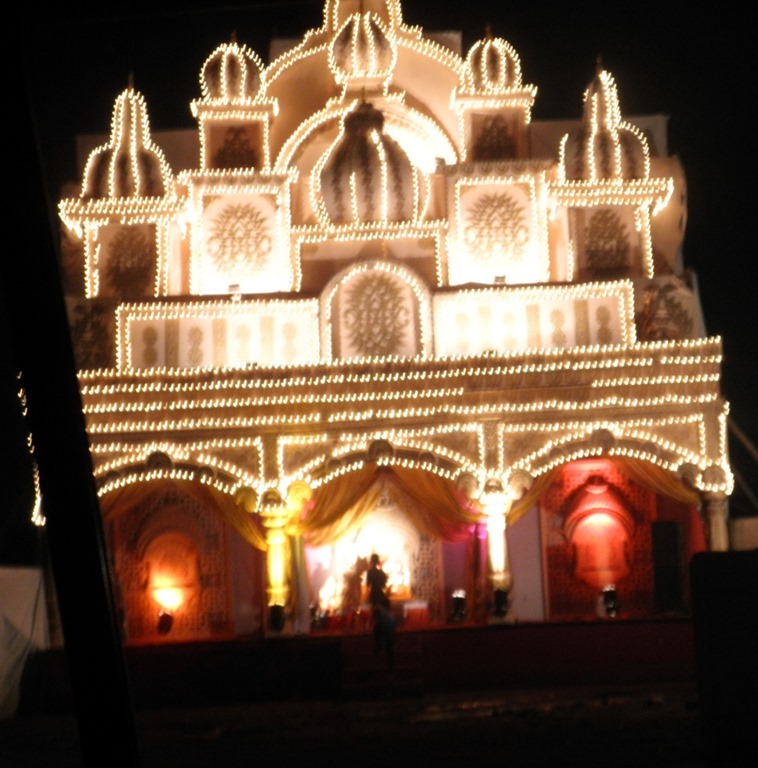 We saw only a very small portion of the pandals, but even so, we lost count at around 50. The only thing these displays have in common is that there is a revered image of Lord Ganesh at the center, as the focal point for devotion and offerings. The housings differ in size, elaborateness, decoration, and other activities. 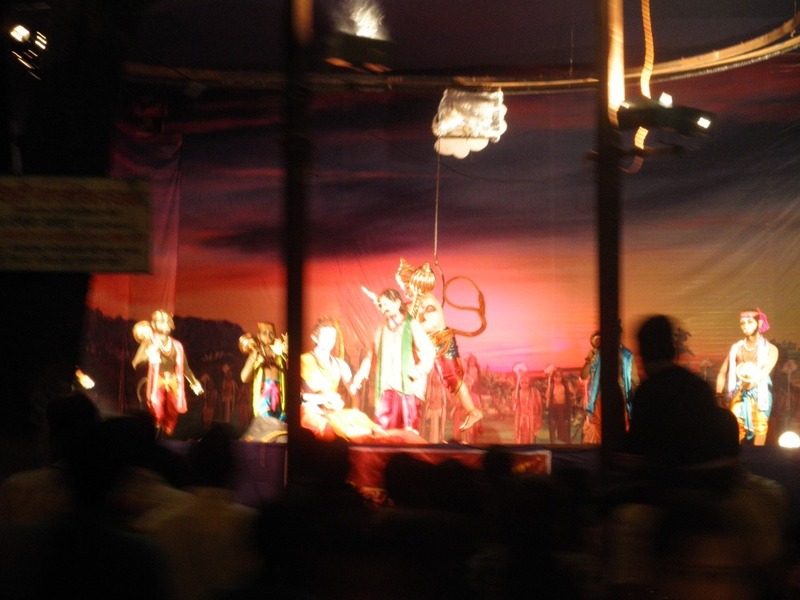 Some include stages for live performances, and in between devotions show live action tableaux, plays, musical performances, puppet shows, or other in-person entertainments. Others include audio-animatronic spectacles, illustrating scenes from sacred texts, classical literature, or history. Some are total light shows, with throbbing music and choreographed displays of thousands of LEDs blinking in time to the beat. Still others include video loops or public speakers espousing various noble causes – respect for women, clean water, universal education, and the like. Some, belonging to smaller, less affluent organizations, pass up the expensive lights and fireworks. Those are decorated with flowers and plaited banana leaves, paper ornaments, or modest household textiles. The most poignant were totally bare, with signs that said that the money the group would otherwise have used for decoration this year has been donated to flood relief in Uttarakhand, the province in which thousands of pilgrims and hundreds of villages were swept away during the June monsoon rains. Here are a few photos of what we saw. Apologies on the image quality. Taking photos at night from a moving car in the rain requires a better camera and a steadier hand than we possess. The architectural fantasy on the left had a large stage with dance performances. The LED creation on the right twirled and throbbed like a Las Vegas sign. 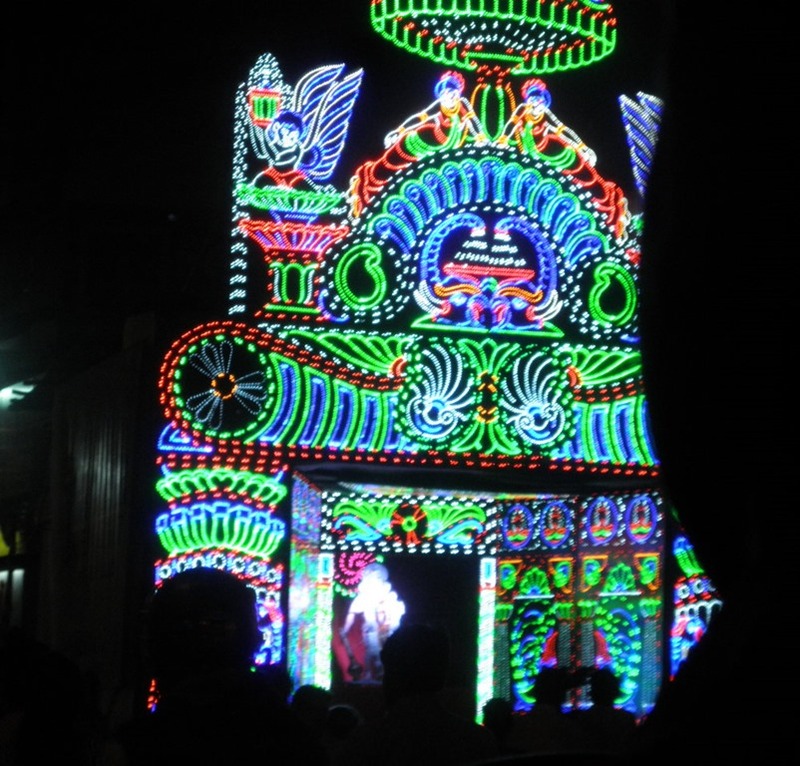 Here’s a GIF made up of images we took, that conveys a (silent) impression of the frenetic dancing lights at yet another pandal. But you’re missing out on the disco-beat drums of the accompanying sound track. 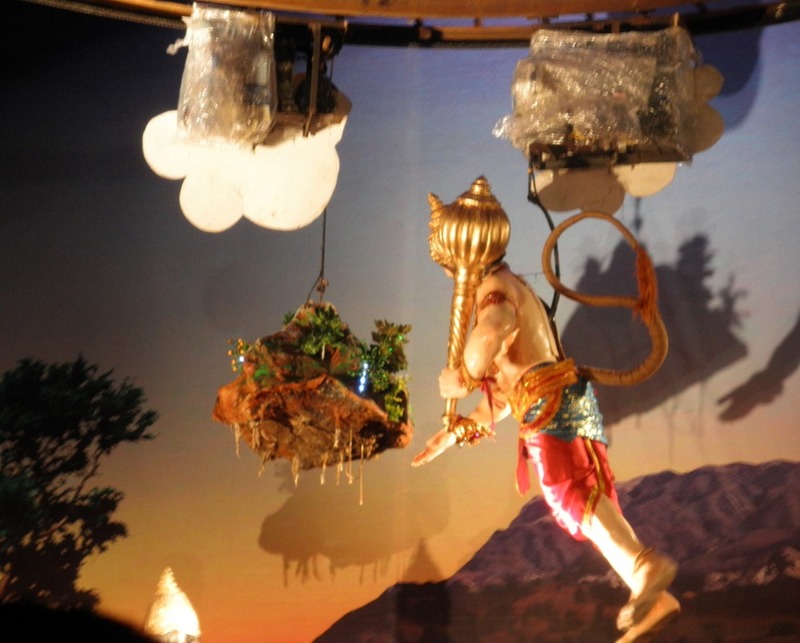 The animatronic display at the site above is of a pivotal scene from the Ramayana. In this story, Lakshmana, the son of Lord Rama has been gravely wounded during the wars against Ravana, king of demons. The only thing that can heal him is a herb that grows on a certain mountain in the Himalayas. Lord Hanuman, comrade of Lakshmana undertakes the quest. Prevailing against a hindering Ravana, the hero Hanuman arrives at the mountain, but even after stretching time for his search by delaying the sunrise, he cannot identify exactly which of its plants the healing herb might be. He solves the dilemma by fetching back the entire mountain (image at left). Lakshmana is saved (image at right), and Hanuman is extoled as a sworn brother of Lord Rama. 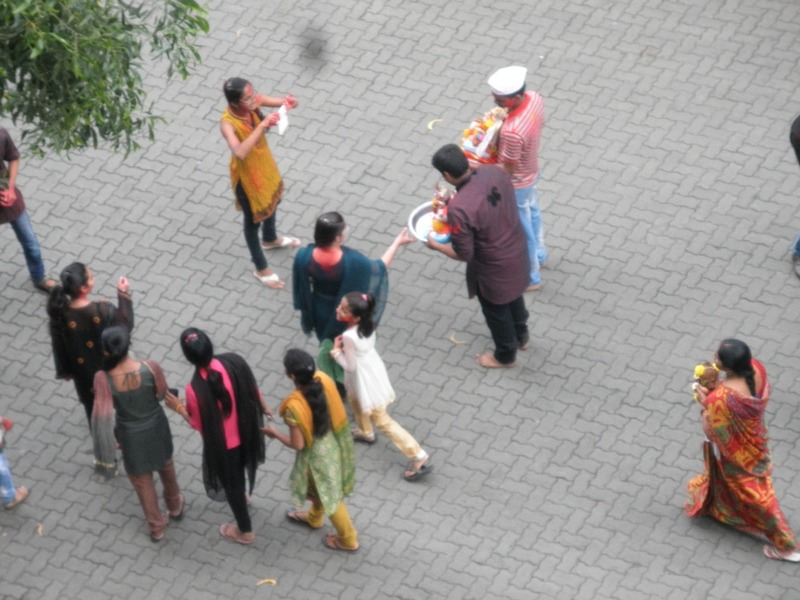 The celebrants are stained with red because they launch red powder at the image as they make their way to the river, three blocks away from our flat. 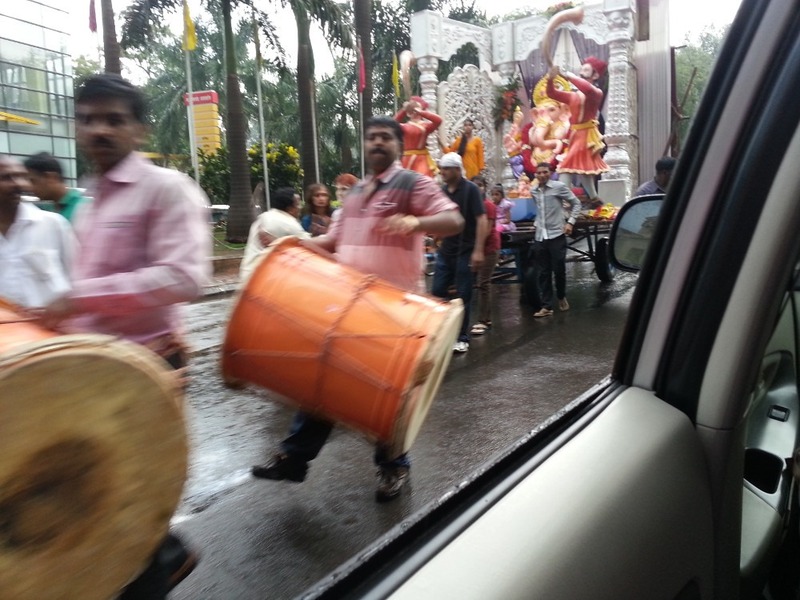 It seems that on the last day, half of the city is in motion, conveying Ganpati to designated immersion spots. Big ones travel in luxury, in massive lorries and carts decorated as elaborately as the pandals (below). Smaller ones are pushed on hand carts (also decorated); or as above – carried by hand. In all cases, the images are accompanied with chanting, drums or marching bands, singing, and dancing. Most processions converge on one of the official staging areas, where the images are handed to special groups hired to perform the final ritual to sink them into the river, either from boats or (if size is a limiting factor) being carried by teams of bearers and swimmers (left). Some families opt for non-official immersion spots, and even risking the rapids themselves (right). Now today, the day after, the city seems empty. Pandals are still standing, but their sacred inhabitants are gone. The structures are being slowly disassembled. They have a slightly forlorn and empty air, as if all of the past ten days of celebration can still be heard echoing across the empty platforms, playing out before their absent Lord. 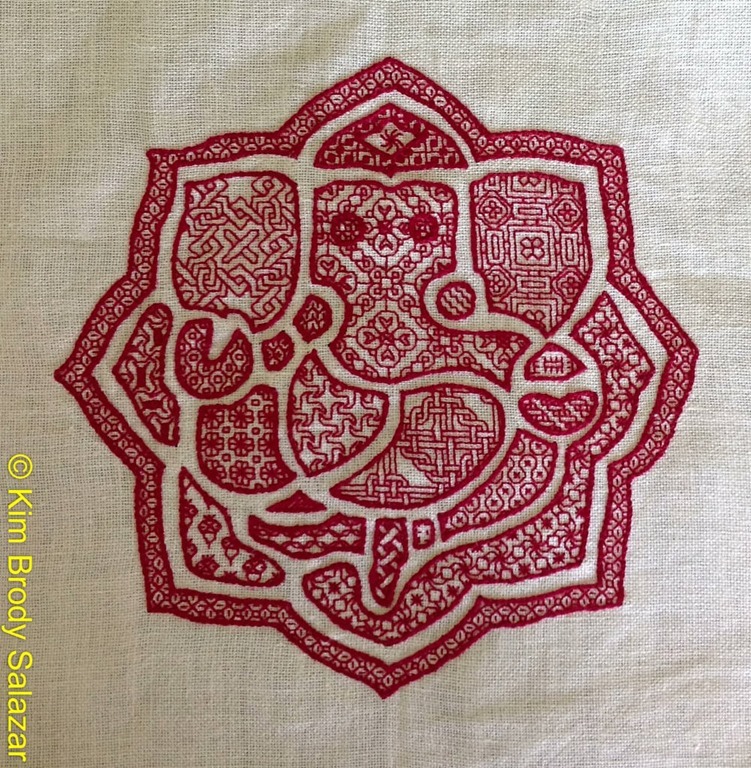 Lord Ganesh is a beloved and hard-working Deity here in India. His image is omnipresent. Aside from gracing his many temples, Lord Ganesh rides on dashboards all over the nation, protecting almost every car, truck, and bus. He wards the door of most homes; and blesses many shops, schools and public buildings. His image has been rendered in just about every medium, from exquisite woodcarving to molded pink plastic. He has been sculpted, printed, woven, painted, and stitched. Hmm. Stitched. So of course, I had to work my own. He’s red because red is a happy color. I’m about two-thirds done, with one ear, some “filler” and some of the lotus frame left to go. I’m very pleased with the way he’s turning out. For the record, I’m using plain old DMC six strand cotton floss, color #498; two strands for the fillings, three four the chain stitch outlines. 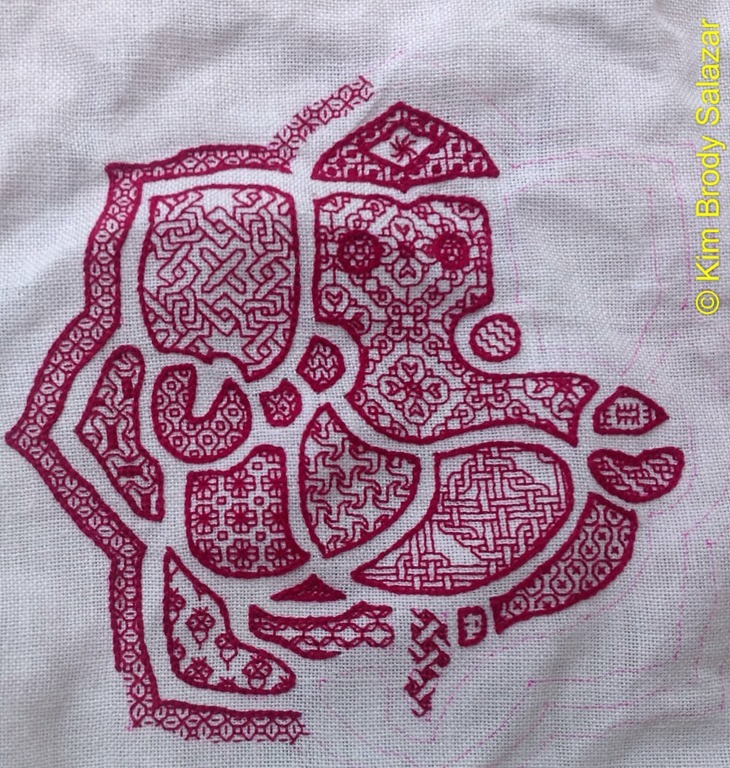 I’m working on a coarse cotton/acrylic “linen” that’s not quite even weave (you can see the distortion in the floral pattern in the face, with the north-south axis looking slightly squished compared to east-west). I’m doing this at (for me) a huge gauge of 16 stitches per inch, and the entire piece measures across from lotus-point to lotus point is approximately 8 inches across. All of the fillings above are from my free Ensamplario Atlantio collection. 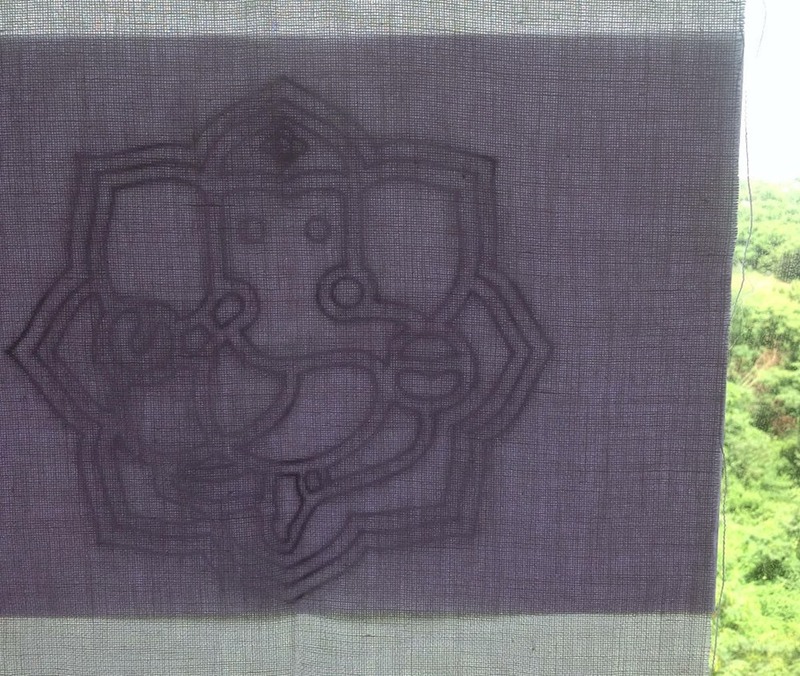 I have a special purpose for my Lord Ganesh, which will be revealed in time. But I’m making two changes. 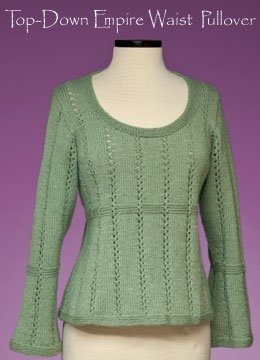 The first is that I’m knitting it in Cascade Yarns UltraPima cotton DK. The original is written for a wool or wool blend DK. That means that the piece will be more massy and less elastic than the original designer’s intent. The other is that I’m shortening the sleeves. I’m moving the garter stitch band up somewhat, so that it aligns better with the band at the waist, and proceeding with the belled sleeves from there, so that the whole sleeve is closer to 3/4 length than back-of-knuckles length. On the yarn – I like it. 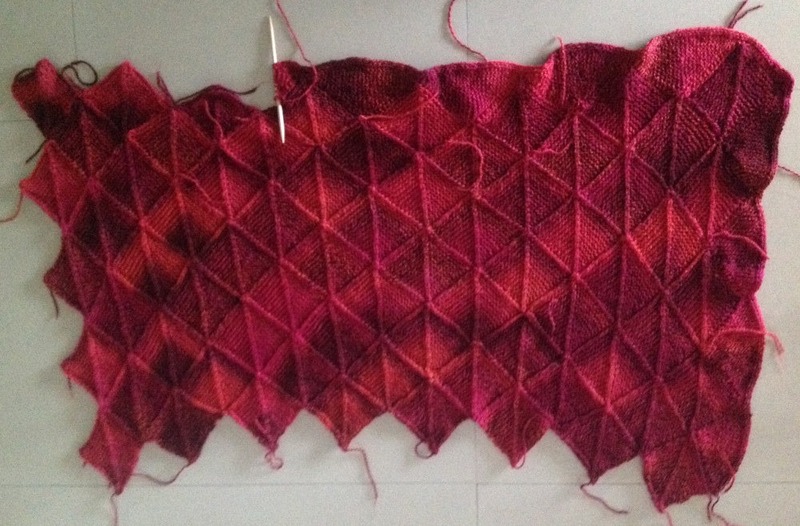 It’s relatively painless for a multistrand cotton DK. It isn’t splitty, and it’s a bit more forgiving in stitch irregularity appearance than is Cotton Classic, my go-to all-cotton DK. It’s also shinier than the Cotton Classic. On the pattern – I note that the range of sizes it includes is superior, from extra small all the way up to 6X. This does make for a confusing pattern presentation though. I made a photocopy and have highlighted all of my chosen size notations. Those who struggle with tiny type will probably want to photo-enlarge this one, too. (To reassure copyright protection advocates, under Fair Use provisions I can do this provided I own the original, and either keep the resulting copy with my original, or destroy it after I’m finished. I cannot give away, sell or otherwise share the copy). 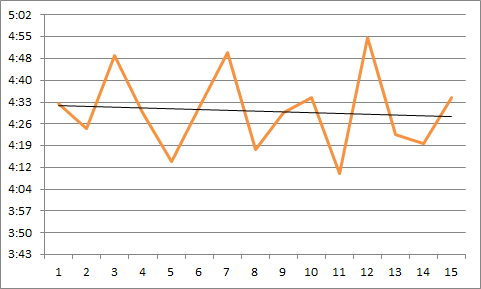 So far the pattern has presented no problems, although I would not call this a pattern for those who have not worked from an classic style one before. For example, you’ll need to know that a hypothetical direction that states something like “increase 0(2,4) stitches 0(3,1) times” means that for the smallest size, you’d increase nothing no times (in effect, skip this direction); for the middle size increase 2 stitches 3 times; for largest third size you need to increase 4 stitches 1 time. The “increase 0” direction can cause distress. I’ll keep posting progress here as I wade deeper into the project. Contrast this lush verdure with a dusty shot of the same area taken this past January. And January isn’t even the depths of the dry season. The driest time is May and the beginning of June, just before the rains arrive in mid-June. I am back from over a week of waiting on lines at the government visa office to renew our residence paperwork. Let’s just say I’m relieved not to be up close and personal with the bureaucracy today. Sadly, I was unable to take my knitting with me to civilize all those hours. It would have helped. 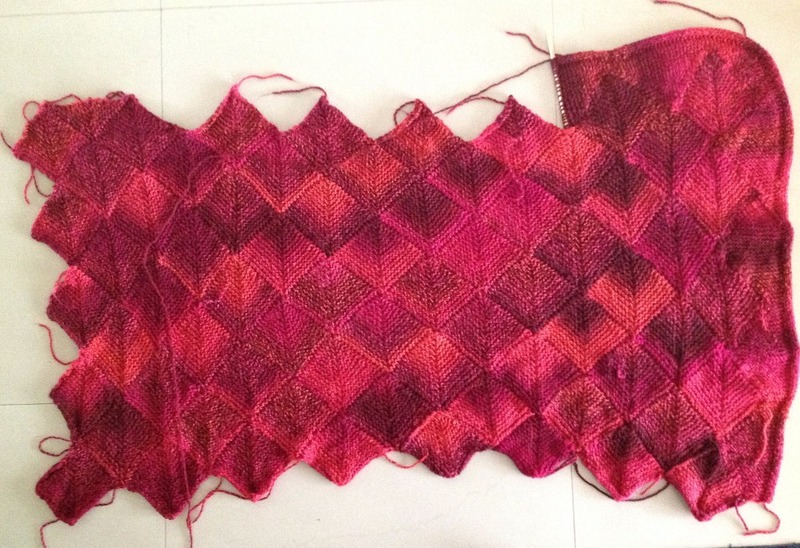 Here’s my latest progress on the big blanket knit from Marble. The current state is on the left, the previous attempt is on the right. 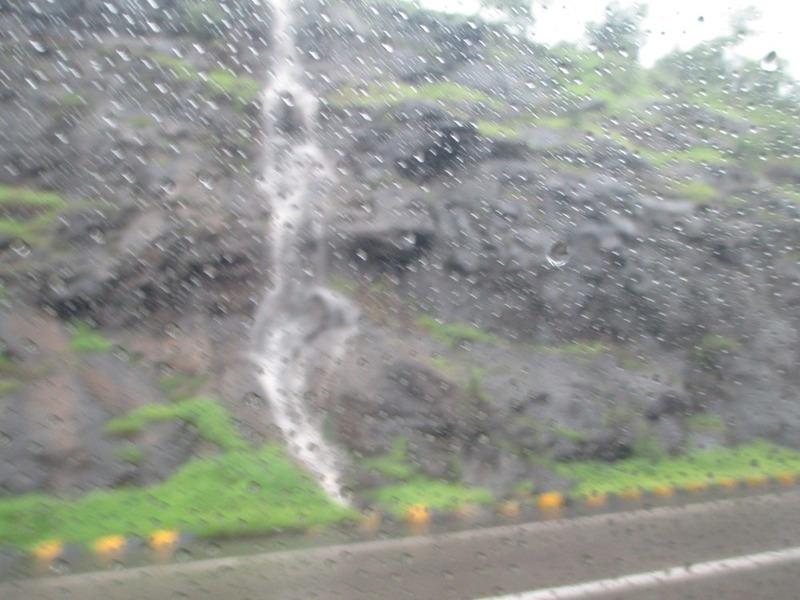 Monsoon continues here, with heavy rain days interspersed with misty, overcast days. The humidity is through the roof. I’m experiencing a bit of climatic dissonance. We do get long periods of grey, dank skies in New England, but they are in the dead of winter, usually when temperatures are down in the low teens or below (that’s -10ºC and under for you Celsius folk), accompanied by intermittent snow. To have this many dark but warm days in a row is new to me. 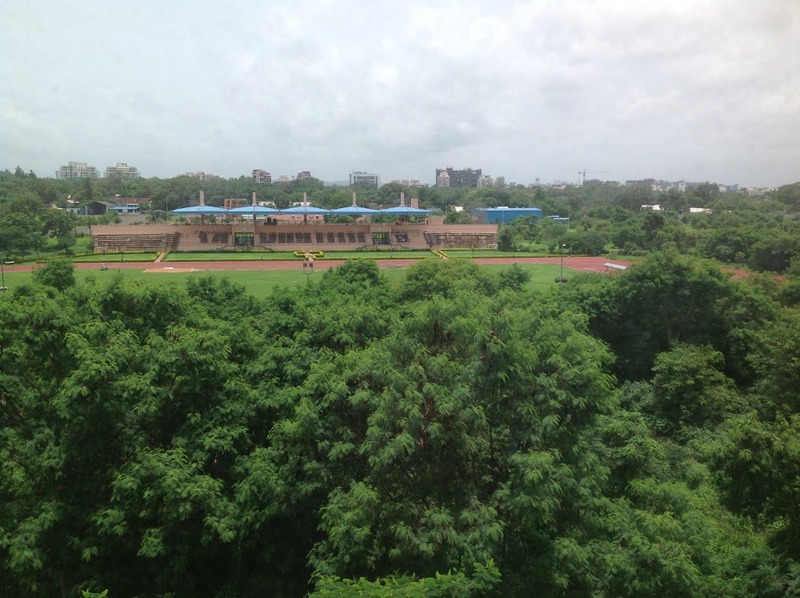 In spite of the greyness, the omnipresent mud and the acne-like spread of potholes in the imperfectly footed brick surface streets, I’ve mentioned the up-side of the monsoon before. Everything is quite lush, and the city is transformed. Even the dusty, trash-strewn vacant lots in town are covered in deep growth, with occasional splashes of wildflowers. This weekend past we went to a patio restaurant, where we dined under a large open air tent. There was a large tree just outside the tent, hung with dozens of child-size umbrellas and spans of tiny bells. Rain fell throughout dinner, making music as the drops hit leaves, umbrellas and the bells. 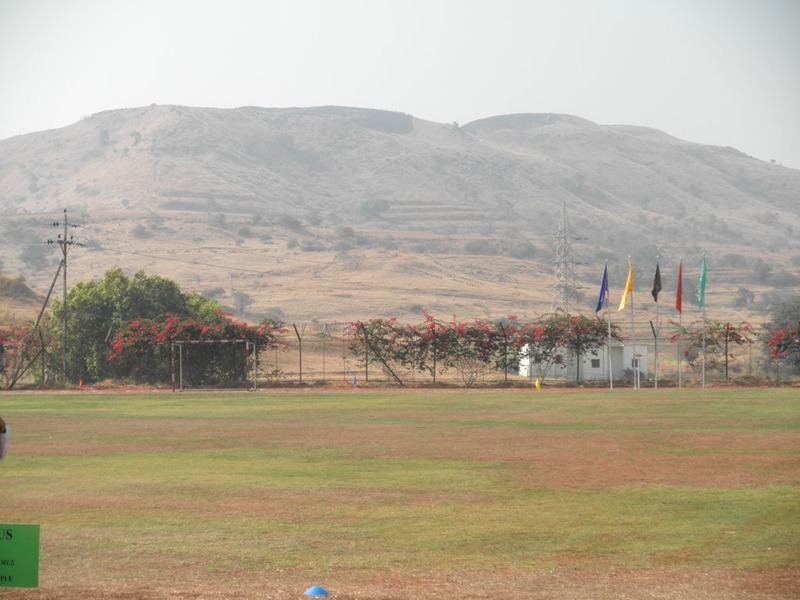 Today we travel out into the surrounding hills where Younger Daughter’s school is. Because we went back to the US before her last semester ended, she had special dispensation to take her 9th grade finals all this week, before school resumes at the beginning of August. I’m looking forward to seeing what effect the rains have had on the countryside and hope to take pix to share. And in addition to my camera, I can bring my knitting! I can report that our Great Migration was successful. 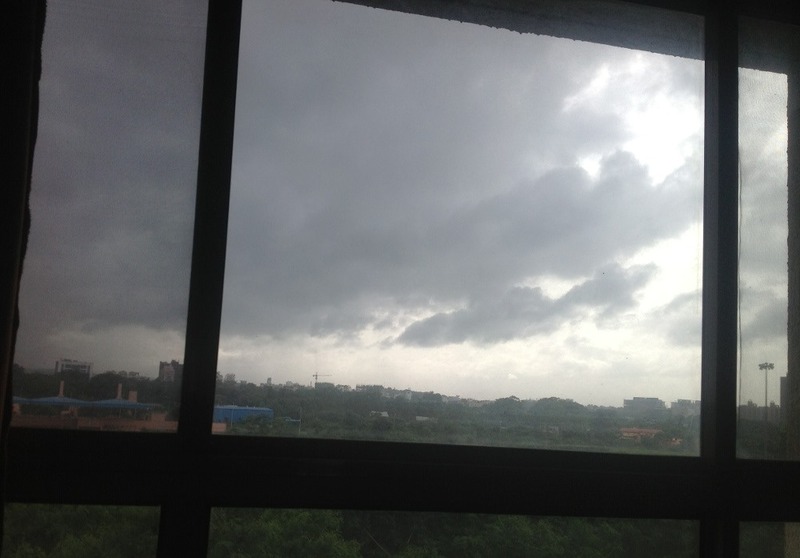 We’re now re-installed in our Pune flat, having arrived mid-monsoon. We’ll be here until next summer. 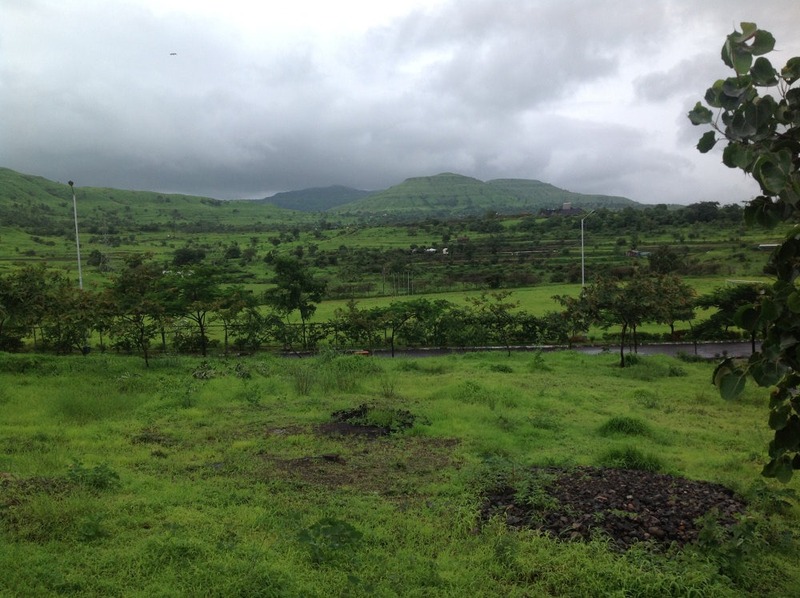 I was astounded at how the arrival of the rains has changed everything. The region is now green. Very, very green. Through the heavy but intermittent rain people were going about their business as usual, but wetter. The scooter riders were still out in force, but soaked to the skin. Likewise the pedestrians. So were the cars, but on waterlogged, slippery roads. Reduced visibility, road construction pothole puddles, and wet pavement make driving here even more hazardous than usual. I was very thankful that Mr. Rupesh was at the wheel. We did see many accidents and breakdowns on the road, mostly mini-cars that had bottomed out when their tiny wheels tried to swim through deep puddles, or heavy lorries with flats or broken axles from encountering potholes at speed. Sad to say, we did pass a couple of serious accidents with injuries, where two-wheelers and larger vehicles collided. In spite of the rain, people here are happy to see it. They don’t seem to be all that inconvenienced. In the US, if it rains on our vacation, we’re sad and annoyed. Here the rain is seen as a blessing. Families plan vacations and outdoor activities FOR the rainy season, and TV commercials are full of happy children, frolicking with family in downpours. 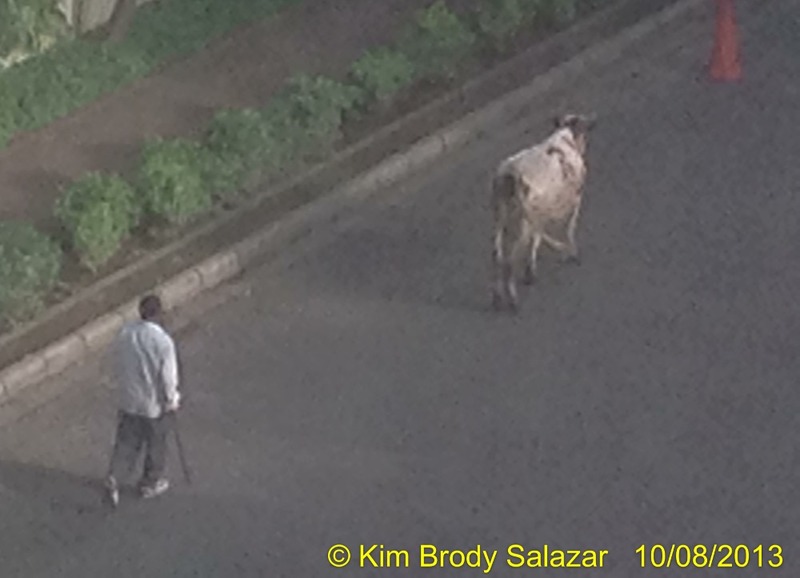 However embracing the rainy season does occasionally end up in tragedy. 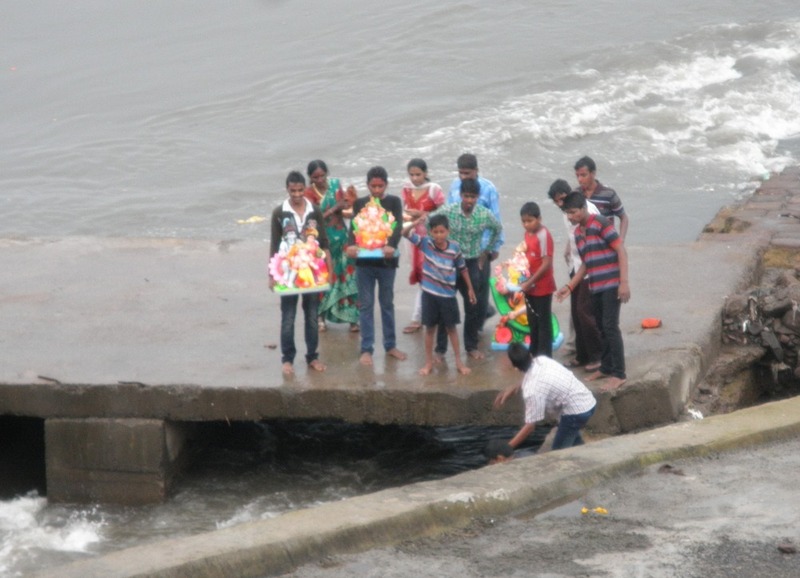 Monsoon is also a season of thanksgiving and religious devotion. Earlier this month thousands of unfortunate pilgrims were swept away or stranded by floodwaters in the northern provinces. But in even in the face of terrible loss, the rains are the lifeblood of the land, and are very welcome here.